My salad obsession continues. Today, I’m sharing a super simple creamy dill buttermilk salad dressing recipe I recently discovered and have come to love. I love making my own dressings. Since being pregnant, though, I’ve done a bad job of keeping up with making my own. If I get a boost of energy that’s when I typically make a dressing. For the most part though I’ve been counting on higher-end refrigerated varieties that don’t have a year or two shelf life. I like to buy the ones that have a month to two month shelf life. At least then I feel a little bit better about buying a store bought dressing and know (and feel) that its a little better for me. 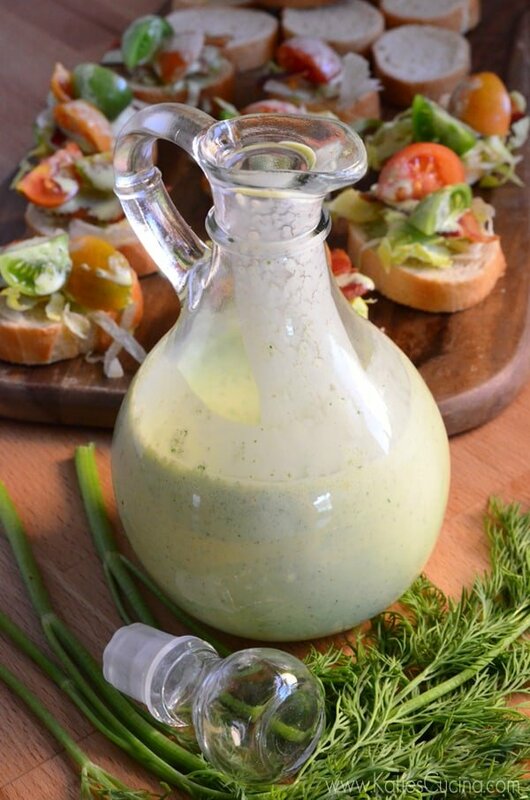 Normally, I would be all for the vinaigrettes, like my Greek vinaigrette dressing, but the creamy salad dressings have been wear its at all pregnancy long. 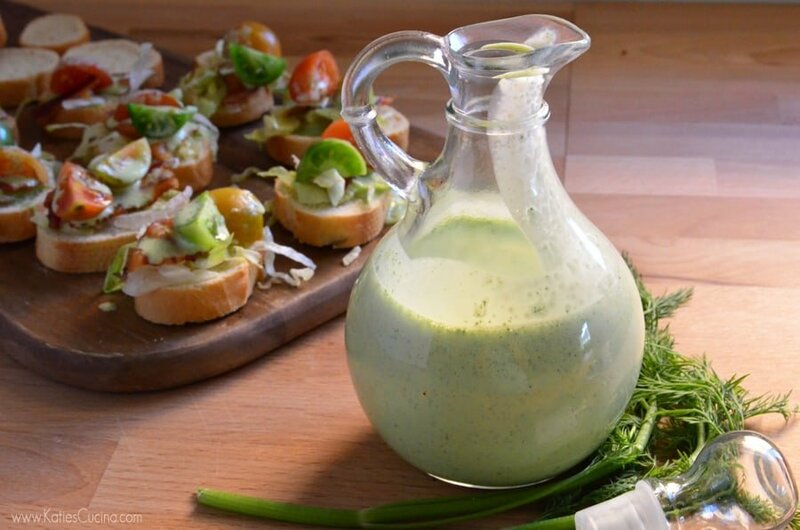 This dressing, like other homemade dressings can be whipped up in less than 5 minutes and stores well in an airtight container. 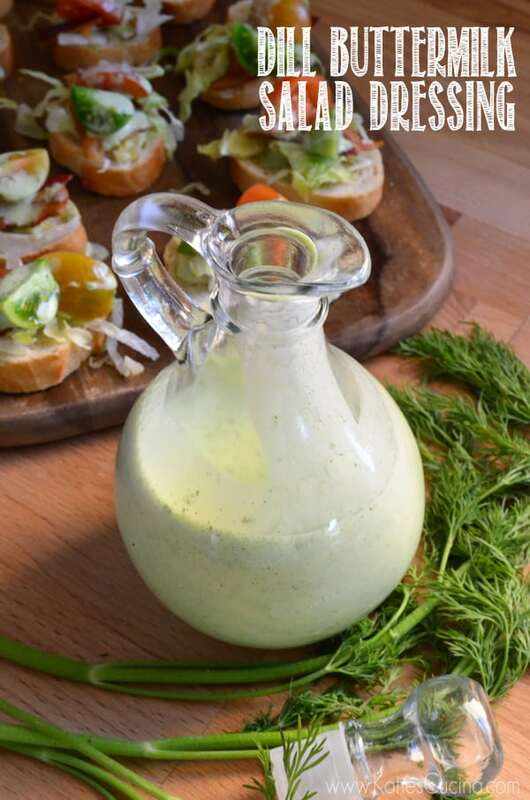 Utilizing fresh herbs from the garden (or store bought) brings this creamy dressing to life. For some reason, I went on a buttermilk buying frenzy a few weeks ago and when I saw I still had a carton of buttermilk to use within a week I had decided I would make a buttermilk dressing. I actually had all the ingredients on hand–so it really worked out well. I also used this salad dressing to top a tasty crostini I served up to friends the other weekend. Remember, salad dressings don’t have to be served just on salads. You can use them to marinate meats, toss with vegetables, or use in an appetizer, like pictured in the background of this dressing photo. I’ll be sharing the recipe for the crostini later this week–so stay tuned. In a food processor combine, buttermilk, mayonnaise, fresh dill, fresh chives, salt, garlic powder, and black pepper. Puree for 20 seconds or until well incorporated. Best if refrigerated for 30 minutes before serving. Store in an air tight jar for up to one week. Sounds like a good recipe, although I’m not a big dill fan, I might change it to basil. 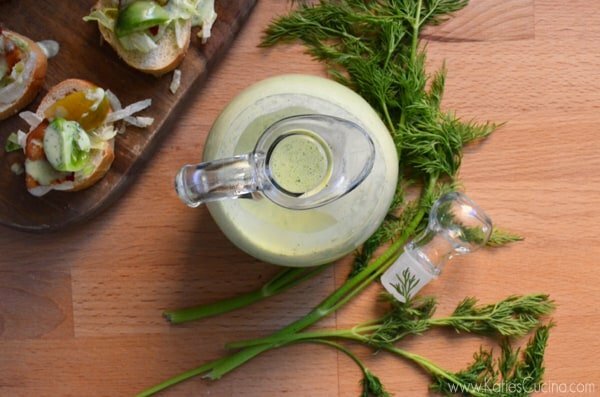 You kind of have to like dill to like this dressing 😉 but any fresh herb would work! What a gorgeous dressing, Katie, and it sounds really delicious! Thanks Christine! It’s so good and refreshing–perfect for spring! This dressing recipe was super easy and tasty — except it was really salty. And I love salty foods. I did use Duke’s real mayonnaise. Could that be the reason it was so salty? Also, do you have any suggestions to thicken it slightly? It was a little runny. Hi! Glad you tried the recipe, but sorry it was salty to you. I use Hellmands so maybe that’s why? I’ve never tried Duke’s so I don’t know! Next time, don’t add any salt at all, blend and then give it a taste test and adjust your salt from there.